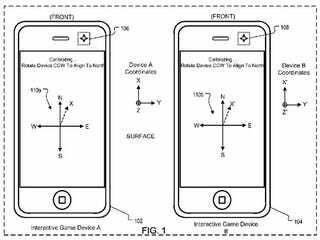 Apple explores the awesome potential of augmented reality in a patent application that describes a multiplayer shooter that allows players to track each other for real using networked iPhones. Augmented reality is more than simply overlaying video game graphics on the real world using a camera. Sure, Invizimals is a hoot, but when it comes right down to it, you're simply projecting graphics onto a video image. Apple takes the augmented reality concept a step further in a U.S. patent application for "Interactive Gaming with Co-Located, Networked Direction and Location Awareness." Basically the patent describes a method by which to or more players holding "interactive gaming devices" (read: iPhones) can network their devices together and hunt each other like animals. The player looks at his or her iPhone screen, where a real-time video is displayed, with graphical projections letting them know the direction and position of their opponents. An interactive game environment includes two or more co-located, networked, direction and location aware interactive game devices. The game devices share a common reference coordinate frame (e.g., a three-dimensional Cartesian coordinate frame). Each game device maintains its own device state (e.g., position, orientation, time) in the reference coordinate frame. Each interactive game device shares its device state with the other interactive game devices using communication technology (e.g., Bluetooth, Wi-Fi, cellular). Each interactive game device can use the device states of the other interactive game devices to project the relative positions and orientations of the other interactive game devices into a local, fixed coordinate frame of the interactive game device. These projections allow each interactive gaming device to know the position and orientation of the other interactive game devices in an interactive game environment defined by the reference coordinate frame. The patent application suggests that these concepts can be applied to a wide variety of games, and notes the possibility of accessories, like guns. The concepts described above can be extended to a variety of interactive games. The game devices can include attachments. For example, a "gun" can be attached to a game device and used by a player to target other players in the real world game environment. In this case, the orientation of the "gun" relative to the game device can be determined. This could be achieved with additional sensors in the gun, for example, and by applying the mathematical techniques described herein. If the ideas represented here come to fruition, it might not be long before we're all playing sophisticated augmented reality versions of Cloak and Dagger. I approve wholeheartedly.